A good start today at 08:30, and a far better day for weather. 20 minutes brought us to the first of the Baddley locks, traffic coming down all of the locks today made for easy passage with minimal hold ups. Neil was now confident enough to take Seyella through the locks, so Mags had an easy day chatting and watching the scenery go by. In fact, from this point on, Neil spent most of his time on the tiller. 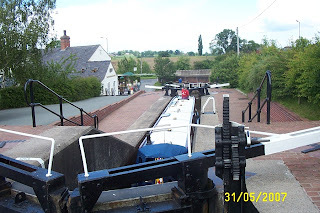 At Wrenbury Mill, the electrically operated lift bridge caused us no problems, although I had had misgivings after a near miss with a car on a similar bridge on the Macclesfield Canal. At Grindley Brook we passed through the 3 single locks, then had a 10 minute wait and a 10 minute passage through the 3 lock staircase. Neil and Seyella in Grindley Brook staircase. The girls dashed? into the shop halfway up for buns and bacon, and got back just as we were ready to clear the last lock. Across Whixall Moss where a heavy shower dampened things down a little…. Neil and brolly in the rain. and moored for the night just past Bettisfield at about 18:15. Away from the mooring at 09:10, a cold and damp morning with drizzly showers. Neil taking turns on the tiller eased the discomfort a little, and a 5 mile run took us to the back of a queue of 5 boats waiting to lock through Minshull lock. It took over an hour to get through, with crews helping each other to speed things up. This was the shape of things to come, with the whole trip being busy with other boats, mainly hired. Through Cholmondeston lock, and down to Barbridge Junction where we had a near miss with a boat turning into the Branch from the main line. Neil managed to wiggle us round with a judicious shove off the bank from me, and we were heading south to Hurleston. On arrival there was a boat coming down the last lock, and one waiting to go up, so I hopped off while Neil manoeuvred to come in behind. At this point Meg decided to peer around the side of the boat, leaned out too far and fell off! Neil acted quickly and hauled her back onboard before she drifted off out of reach. While this was going on, the boat had come out of the lock, another hire boat, a 70 footer from Viking Afloat had jammed itself across the junction trying to make the turn, holding up several more on the main line and our boat was drifting across the junction while Neil was sorting Meg out, so you can imagine the scene. And my camera was on the boat with me on the bank! Anyway, we all got ourselves sorted out, mopped up the trail of canal water through the boat, and got going up the Hurleston flight with Mags on the tiller. We were through the 4 locks by 15:00, did the essentials at the services at the top, then pressed on to and through the 2 Swanley locks before stopping between bridges 11 and 12 at around 17:35. A late start today due to poor weather, but the day was brightening when we moved off at 11:45. 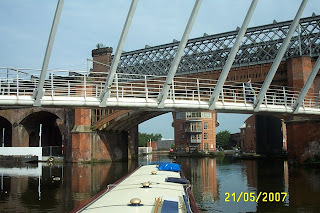 Through Northwich, and a stop at bridge 183 for a bit more shopping, then to the Marina. I’ve a problem with the oil pressure readings on the engine. I think it’s the sender unit, rather than a fault with the pump, but I wanted confirmation before going much further. As usual a crisis was in progress, so it was gone 2 before Kevin could take a look and confirm my opinion, then he had to order the parts required, so we set off again at 15:00. We’ll stop to get the job done on the way back up, later in June. 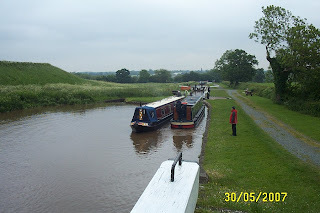 We pushed on down to Middlewich, through the locks to Wardle Junction, and through the first 2 locks on the branch across to the Shropshire Union before stopping between bridges 24 and 25 for the night. The time was 19:30. We’re not used to these late days, but at least it stayed reasonably fine, and the crew seem to be enjoying themselves. We moved down to Preston Brook, and waited just past the motorway bridge for our guests for the rest of the week. They arrived as planned, and we set off down to the tunnel. A short wait and we were into the darkness, an interesting experience for Neil and Val. What they didn’t know was that there were 2 more to do before the day’s end! After a gentle run we went straight through Saltersford and Barnton tunnels, then stopped at Anderton for a look around the boat lift. A very interesting visit, well worthy of the awards it has received. As it is a Bank Holiday, there were several boats moving up and down from the canal to the River Weaver, which made it all the more entertaining. 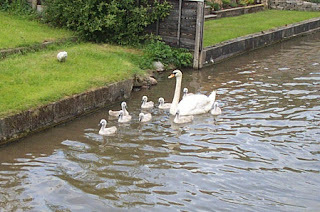 The cygnets at Anderton are getting bigger. Must be the tourists feeding them. Finally we moved up to our regular spot near Marbury for the night. I realise now that I’ve slipped up in not downloading the photos from Val’s camera before they left us. That was my intention, so I’ve not taken many of my own. B*****r! N & V are with us till Friday evening, when Howard will come down to collect them from wherever we are. The original plan was to go down to Middlewich, across to the Shroppie on the Middlewich Branch, then head north up to Chester. 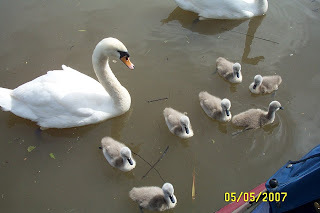 But I had a rethink and decided that the Llangollen Canal would be a far more rewarding experience for them. So we’re turning left at Barbridge, heading down to Hurleston and on to the Welsh canal. The day has made for a poor start to the trip, drizzly most of the day with occasional heavy showers. Everything went according to plan! 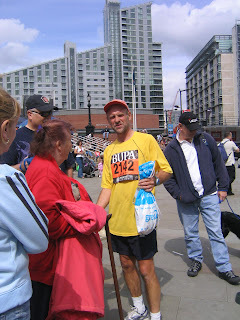 We arrived at our rendezvous point near Moore PO at around 10:30 as our delivery was due between 11:00 and 13:00. In the event it arrived at 12:45 with no problems finding us at all. The driver thought we were off on a round the world cruise though, with the amount of stuff we took on board! Still, you have to top up as best you can when you live on the canal. It’s sometimes not easy to get a decent shop done within walking distance of a mooring. Thanks to Sue on NO PROBLEM for the advice on her blog about how to go about organising a home delivery to a boat. We’d just about got everything stowed away when Val and John, old friends from Ingleton, showed up. They were on their way back from visiting family near Oxford, and broke the journey to see us. A pleasant hour or so was spent catching up before they continued homeward, and then we cruised up to London Road bridge to turn around before returning to our Saturday night mooring spot, facing the right way now for our pick up point for Neil and Val at Preston Brook. Just a short hop today to a mooring spot we’ve used before, near Red Brow underbridge on the Bridgewater. Here we are just 30 minutes from Moore, where (hopefully) our groceries from Tesco will meet us. It’s been a damp and breezy day, but short. Yesterday I spent still doing the finishing touches to my refit in the galley/dinette area, then we set off back north again at 12:25. A fine bright but breezy day saw us clear Anderton services, then back through Barnton and Saltersford tunnels to moor for the night just past bridge 211, looking down on the River Weaver. Took Meg for a splendid walk down to the river, along past Dutton lock, then back up to the canal across some fields. We are heading back to Moore on the Bridgewater, to receive a Tesco home delivery on Sunday. This is the first time we’ve tried this, so I hope it works out OK. We need to stock up as we are collecting Neil and Val from Canada at Preston Brook on Monday morning. A fine bright morning, but a later start for us. We aimed to catch the 11:30 passage “window” through Preston Brook tunnel, so set off at 11:00. Both Preston Brook and Saltersford tunnels have time controlled passage restrictions. Heading south, you may enter PB on the ½ hour, up to 20 minutes to the hour, allowing a 20 minute passage before northbound boats enter on the hour till 10 minutes past. Saltersford, being shorter in length, has a 20 minute entry window. The system works well, and saves the inevitable confusion at busy times when boats meet in the middle! The distance between Preston Brook and Saltersford is just 2 hours of steady cruising, so you generally go straight in without having to wait. 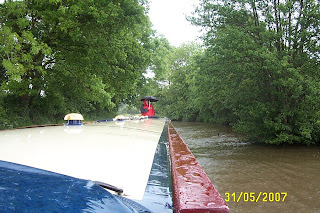 We followed 2 boats we have seen regularly on this stretch, ETHEROW and PILGRIM, through Preston Brook, but they stopped soon after so we had Saltersford tunnel to ourselves. 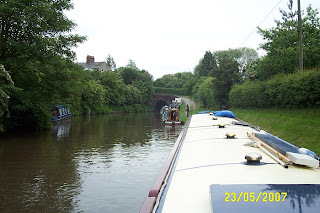 Next is Barnton tunnel, no restrictions here, you just have to look to see that the tunnel is clear before entering. Luckily, unlike Saltersford, you can see right through from one end to the other. On down past the boat lift to Anderton services, where we did the necessaries, then another 15 minutes saw us at our regular spot near Marbury wood. Heading south still, from Dunham Massey to Daresbury. We were going to stop at Moore, where there is a handy shop, but decided to press on for another half hour to have a look at possibilities for mooring near road access for friends visiting next weekend. We didn’t stop at Lymm this trip as we’re OK for supplies. The day has been fine with sunny spells, but with a blustery wind. Finished the day at around 15:30, time for some more internal work, this time on front corner cupboards. We stopped at Thorn Marine in Stockton Heath for diesel, and were shocked to hear about the imminent closure of this useful boatyard/hirebase/chandlery. Apparently Peel Holdings, the lease holder and owner of the navigation, want to redevelop the site as luxury housing. See www.thornmarine.co.uk for more details. Away from Castlefield around 09:15, after watching the performance of a couple of hire boats going up lock 92 on the Rochdale, heading for Duckinfield junction on the Cheshire Ring. A gentle run down to Dunham Massey, where we’ve stopped overnight on our previous trips. It’s good to be back in green fields after 2 days of concrete and tarmac, but Manchester was OK, interesting in an urban sort of way. 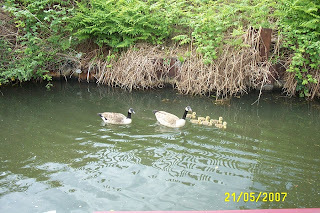 There’s good shopping at Sale, with a Co-op and a B&Q within easy distance of the canal. The Bridgewater is wide and deep, and a lot of the boaters treat it like a motorway, tearing along with huge bow waves. You couldn’t do that on the Trent and Mersey! There are plenty of pleasant moorings once you get clear of the city connurbation, and the anglers mostly say hello! 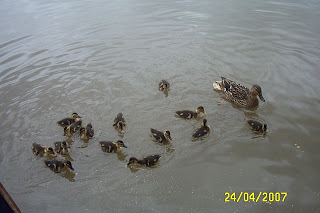 The batches of youngsters are doing well in this area, with families of ducks, swans and geese, and the odd moorhen. 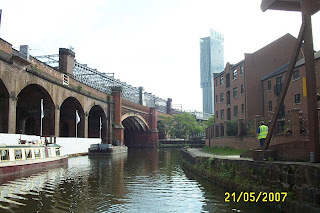 As mentioned on the last post, we arrived at Castlefield yesterday. What I didn’t say was that it was raining when we arrived, which turned into heavy showers, some with hail! Not looking good for the race, but today dawned fine and dry. Up early and a walk up to the end of the G-Mex to leave Mags and Meg and head off to the start. Howard, with Neil and Val from Canada, should have arrived, but were running late. I had a good run in near perfect conditions, missing my 45 minute target by just 2 seconds! Still, it’s 4 minutes faster than last year so all that training has paid off. If I keep improving at this rate I’ll be running world class times by the time I’m 55! Micah Kogo won the mens race in 27:21, taking 4 seconds off the previous record. All our guests had arrived by the time I got back to our meeting point, so we had quite a crowd heading back to the boat for a buffet lunch we’d prepared yesterday. We had Howard, Neil, Val, Ruth and her grandson Connel, Mags granddaughter Melanie, with her children Emma, Joanne and Laura. 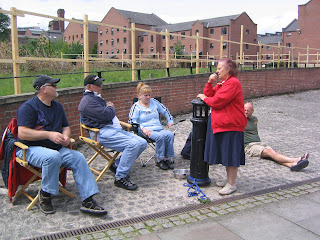 The afternoon was fine and dry, just as well as we spilled out onto the quay. The kids spent the time playing with Meg, while the adults sat about talking. The visitors didn’t leave till around 15:30, and, as it is around 2 hours cruise to get through Sale and Stretford and out into a decent mooring area, we decided to stop another night and leave in the morning. Hi all. First off, let me apologise for not updating this log for 6 or 7 weeks. 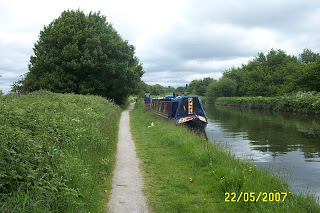 I’ve been pretty busy, what with the refit of the galley and dinette, pretty intensive training for the Manchester 10K, not being able to get an internet signal a few times…….. The excuses are getting a bit thin, now, aren’t they. Anyway, you’ll be pleased to hear we’ve not been abducted by aliens, got stuck irretrievably in a lock, or sailed off the end of the map. And here’s what we’ve been up to. We went down to Orchard Marina as planned on Monday, only to find they weren’t ready for us. So we did the “essential services” and moved back down to the flashes till Wednesday. On our return, we were still not able to get into the dry dock for bottom painting, but we were allocated a berth with power, so I could start on the galley and dinette refit. The boat finally went in to the dry dock on Tuesday May 1st, so we used a hire car to go back up to Ingleton, and stopped the night with George and Christine. Took the opportunity to catch up with a few friends, but had to dash back to Northwich to get the car back Wednesday lunchtime. Before we left the marina we had the engine and gearbox serviced, then came away finally on Saturday and went back up to the flashes for the weekend. 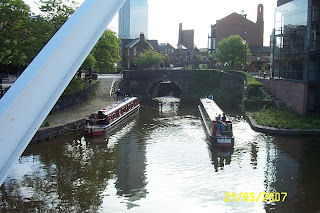 We set off north up the T&M on Monday 7th, spent a couple of days near Marbury country park near Anderton, and then took a steady 3 days up to Castlefield at the top of the Bridgewater Canal, arriving on the Saturday 12th, and stopped overnight to check it out. 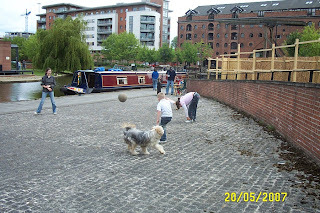 Pleased with the mooring and security, even in the middle of Manchester. Castlefield is only about 10 minutes walk away from the start of the Manchester 10K, so is an ideal stop-over for the race. 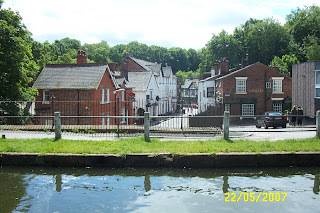 We toddled off back down to Marbury, as a BW licence only allows 7 consecutive days on the Bridgewater, spent a couple of days, and then cruised back up, leaving on the 17th to arrive on Saturday 19th, to find the basin packed with Lymm boat club members on a weekend away. We managed to squeeze on the end of the mooring, though. All in all – Locks 3 (the same one 3 times! ), miles 99.